Not shocking that I am rules nerd given the topic of my book and this blog. I had the pleasure of reading a book recently about one of the greatest rules controversies in the history of the game. There was a doozy of a play in game 5 of the ALDS. Here is what happened – with 2 outs and a runner on third, a batter takes a pitch. 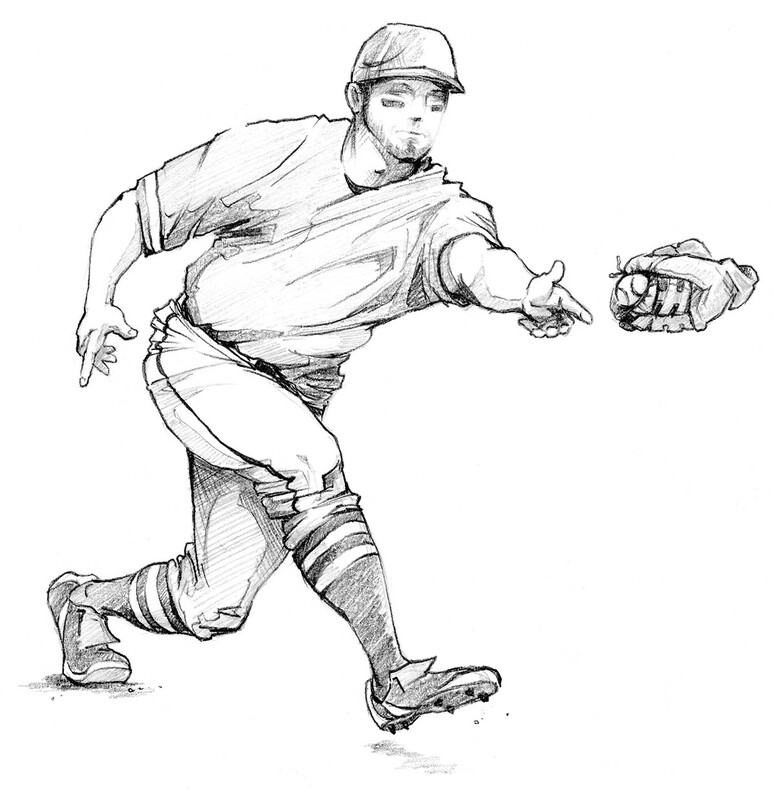 The catcher’s return throw hits the batter’s hand (while he is in the box) and deflects away. The runner from third races home. Anyone who watches SportsCenter or surfs the web for anything sports related has certainly seen this play. Cub Anthony Rizzo goes up the tarp, on the lip and eventually into the stands to make a catch. The umpire originally ruled this play a no catch. After conferring as a crew, the play was changed to a catch and then a one base penalty. To say the end of the Reds/D’backs game was interesting last night is an understatement. I work a lot of summer ball. A lot of times in summer ball there is not a scoreboard. Coaches come up to me all the time and ask the score. I honestly don’t know. I have enough to keep track of. I usually make a quick joke about umpires being taught only to count to 4. The baseball rule book does not get additions very often. On top of that, casual fans cannot recite very many rule numbers. There is one circumstance where these two rarities become a reality: Rule 7.13 (old format). Some folks call it the Buster Posey rule since his injury was the catalyst leading to the rule. It is the home plate collision rule. Most of the time I am not puzzled by a call (or non call) on the field. This is not the case with this play. There are two guys who dress like umpires, sit right home plate, and mimic the home plate umpire all night. Here is a clip. I actually think this is pretty funny. The guy on the left (from the camera) actually looks the part a little better. The backwards hat kills all credibility for the other dude. While the main purpose of our book is to make learning the rules easier. This is done by better organization of the various rule sources. The ancillary benefit of it is mythbusting. If rules are easier to find and understand, then myths can start to die. I am probably over my skies with that dream, but I might as well aim big. Check out this odd play. If this happened on the diamonds I work, I would have a coach out asking me about interference. They figure that something this odd has to be an illegal action on the offense’s part. As a runner, there are a couple of things you can do that will earn you a trip to the dugout as an out. You can be struck by a batted ball. You can interfere with a fielder making a play. Both are odd occurrences. A lot of people (including umpires) think they are handled the same. Turns out there is one important difference in the rules – it is around deflections. There is a group of umpires who like to make up ridiculous situations to test rule knowledge. These are called 3rd world plays. There is another group of umpires who get annoyed at this practice. They figure those plays won’t happen. Well, odd plays do happen. Check out this one from the Cubs game last night. Check swings have been getting more heat this year than I remember in years past. This is one that happened recently leading to an ejection. Not sure why folks cannot remember the rule on this one. If it is called a strike by the home plate guy, it is a strike. If it is called a ball, then he can grant an appeal. That is not the umpire’s choice – it is the rules. I know it is early in the 21st century, but this guy gets vote for dad of the year. He manages to catch a foul ball while holding his infant son. He also managed not to drop the bottle during feeding time. It should be a cool thing to tell his kid about one day. Fans say umpires are at their best when they are not noticed. Most umpires don’t like to inject themselves into the game. The goal is to let the players decide the outcome. Washington fans wishes the umpire would have injected himself more into Max Scherzer’s game over the weekend. Yesterday’s Indians/Cubs game was an absolute smashing by the baby bears. The final score was 17-0. You can see the box score in all of its glory here. Although the score was lopsided that was not the most interesting thing about the game. The Indians used not one but two position players on the mound in the game. Nothing is more scary for an umpire than taking one off the head. Look at what happened in a MLB game the other night. It seems as if the default when this happens is to now get the guys off the field. I think this is a great development. You only get one head in life. Safety should always be the driving factor. It is a book that takes the difficulty and confusion out of baseball rules by putting all the information on one page. Umpires expect to get hit with the ball from time to time when working the plate. It is just part of the job. Of course, it does make it hurt any less. We also know on occasion a ball might get is in the field from the batter. Again, part of the job. What is not expected is to take one in the back from the bullpen. Most of the time when I talk about rule differences it is between varying levels of baseball. Turns out some baseball umpires also work softball. There are some rule differences there as well. Some of them are pretty goofy. Take this play for example. Giants pitcher Chris Heston pitched the first no hitter of 2015 last night. He struck out the last batter looking with an absolute cockshot on the outside corner (and no that word has nothing to do with what you think it might). Whenever there is a no hitter, the performance of the umpire is examined. Thanks to tools like pitch f/x and websites like Brooks Baseball this is much easier today. Let’s be honest, the rules for detached player equipment have to be in the book. I mean I guess it could happen. But, I have never seen it at any level. If it did happen, I would probably just be in shock and not know what to call. This might have been the case in a Braves game the other night. A Tale of 2 Collisions. There were 2 plays over the weekend dealing with interference. Both were called correctly but the outcome was very different. First, let’s look at the important part the rule. It is 6.01(a)(10) : 7.08(b) in old format. There was a very odd play in the Cubs/Nats game yesterday. Where do we begin. First, Kris Bryant seems to reach the area of first base before Gonzalez touches it. But, Bryant does not touch the base. You Don't Need Me on that Wall. Spectator interference is actually pretty rare. It does not mean it does not happen. Here is a play from the other night. Rule 6.01(e) (3.16 in old format) covers this. The distinction on this play is where the fielder is at. If the fielder goes into the stands, he is fair game. If the fan comes over the field, it is interference. In terms of grabbing an easy out, they don’t come much easier than this one. A common rule myth is that home plate is in foul territory (it is not) or a ball that strikes home plate is foul (it is not) or finally a ball that hits behind home plate is foul (it is not). Check out this awesome play by the Brewers catcher in yesterday’s marathon win. The ball is hit, popped up, and caught in foul territory. The count was 2-2. The umpire signaled foul tip and called the batter out. This quote appears (with some added profanity) in the movie Bull Durham. Umpiring is serious business and most folks I know take it very seriously. Of course, that does not mean there are not moments where some fun is appropriate. Odd Play at the Plate. This is an older play but I just came across it. The ball gets away from the catcher and the runner on third attempts to score. The pitcher covers home, gets the ball and tags the runner behind his back. Buried in the rule book at 6.02(a) PENALTY (old rule reference 8.05 PENALTY) is the exact penalty for a balk. How to Make a Manager Mad. Baseball at its heart is a simple game. On offense you hit the ball, touch the bases and score runs. On defense you try to prevent the running of bases. Key in all of this is actually touching the bases. It is a necessary condition of the game – even on base awards. When is a Ball a Strike? I have discussed on this blog the differences between high school and professional rules. Most of the time they really don’t amount to much and other times it causes some potentially goofy rulings. Here is a play that happened recently in the majors. Talk show legend and fellow Hoosier David Letterman hangs ’em up this evening. Anyone who watched his show for any length of time knows how big of a baseball fan he is. In a merging of his genius with this blog, I present to you a couple of top ten lists about umpires. Completely unknown to me (not that I matter but I tend to keep up on things about the rules), Major League Baseball recodified, and reorganized their rule book for the 2015 season. They are available on Amazon and online. One of the running gags on Arrested Development was the line “I’ve made a huge mistake”. You can almost see the thought bubble over this baserunner’s head saying the same thing on this play. A Golden Sombrero is a term given to a batter that strikes out four times in a game. Not a good thing to have happen. But, if you are a pitcher and you strike out 4 batters in an innings, this is a good (and rare) thing. The latest to do it was Kenley Jansen for the Dodgers. Runners on first and third with 1 out. Fly ball to the right fielder who throws to first for the double play. Just an awesome play. The run did not count in this play. The out happened before the run crossed. The key question – would the run have counted if the runner crossed the plate before the out at first. Fair/foul balls are not usually subject to arguments. There are always exceptions though. Here is a play in a recent Yankee game. What does it take to be a fair ball? That is why You Wear a Mask. Here is a pretty interesting foul ball. The more interesting question is what would happen if this was just a pitch that got lodged in the mask. That's a Fou... er Fair Ball. As long as the ball has not crossed first or third base, or if a fly ball has not landed beyond first and third base, it is neither fair or foul until the ball is touched or comes to rest. This ball starts five feet foul and then comes back fair. It was a strange Cubs game yesterday. I already discussed a goofy review play. Here was another play from the game. The umpire ruled that David Ross interfered with the pivot man. This caused the batter runner to also be called out. Here is a play that almost had a double review. The batter bunts the ball and runs to first. He clearly beats the play, but the umpire calls him out. It happens and this is why there is replay. To finish up my one day two part series on baseball cheating in honor of deflategate, let’s talk about the pitchers. I figured with DeflateGate (or Ballghanzi) in full swing I would take the time to talk about some baseball cheating. First, my thoughts on DeflateGate…I don’t care. I don’t think it really had any effect on the game, I bet other players do it all the time, and I am just sick of how the 24 hour news media blows these stories up. If Brady gets a suspension I think that is pretty silly (and I am a Colts fan). Here is a play that is making its way around the internet – a walk off infield fly. Here is the key part of the definition – from 2.00 INFIELD FLY. Occam’s razor is a problem solving principle that basically boils down to “the simplest explanation is almost always the right one”. As I have discussed before balks are very complex. A flinch here, a crooked step here, or an uncompleted throw can all be a balk. Call Them Foul Ball Boys. A ball boy in Cleveland decided he would insert himself into the action. It happens. When it does the umpires can impose any awards or penalties they feel nullifies the act. Here is a play that is making the rounds today. Well, that escalated quickly. The catcher was clearly trying to get an interference call. Should the umpire have granted the interference? Runner on second. Pitcher comes to set, raises leg and turns toward second. Shortstop was covering bag. Second baseman was in his normal position. Pitcher for some reason throws ball to second baseman. I called balk because pitcher did not throw to occupied base, or to anyone involved in covering occupied base or runner advancing to base. What do you think? Ran across this tweet from Jayson Stark this morning. Side note: Jayson’s article on the baseball rule book was one of the key inspirations forour book which this blog supports. He is a heck of a nice guy and ever was gracious enough to give some early feedback on the project. In a recent game Ryan Zimmerman actually hit the ball twice on his swing. Here is the play. The question becomes is this anything other than a cool moment. First place to check – is it a foul ball? A Balk So Nice, I Did It Twice. Reds pitcher Johnny Cueto was a little too deceptive for his good the other night. He was called for a balk in the 1st inning. The umpire does an elaborate chicken dance to explain the call. What is he trying to convey? Instant replay is in its second year. The process is pretty well down pat now. But, I have rarely seen it to end a ballgame. Chalk up this play to “it happens to all of us”. The ball clearly hits the base yet the umpire calls a foul ball. Right away from the look on his face, you can tell he was unsure. This play happened last week. It involves a potential play that hardly ever happens – interference by a base coach. On TV and movies “breaking the 4th wall” is when characters speak to the camera. Think House of Cards, Ferris Bueller or Zach Morris. Basically they are going to a place that is not usually allowed. Alex Gordan is the clubhouse leader for catch of the year after this grab where he went where he is not usually allowed. Here is something you don’t see every day. Eric Young Jr “bunts” the ball into short right field for a base hit. I like how he stands on first and has the look of “I meant to do that”. Regardless, this play does have one interesting rules component to it. It is one of the things that defensive coaches say most to me when I am doing kiddie ball. Brandon Phillips is one tricky(and smart) player. Here is a play from yesterday’s game. Some folks would cry foul and think the runners should not be out. Let’s break this down. First question – is this an infield fly? When the Rules aren't the Rules. Baseball at its heart is a very simple game. Hit the ball, run in a circle and score a run. Other side, try to get three guys out before they circle the bases. Yeah, there are nuances and oddities in there, but for the most part weeks will go by when all that is called is out/safe, ball/strike and fair/foul. Appeal to a Higher Power. I love appeal plays. It rewards a heads up defensive team. They don’t happen very often. You get to see the umpire make a nice solo out performance. They are just fun all the way around. Interference calls are a mixed bag. They don’t happen very often, but they are really not all that hard to call. Some of our most popular posts have updates. This post discussed Joe West and his reluctance to get help on a check swing. As you remember, the umpire is not compelled to check if he rules a strike. However the rules do stipulate that if the pitch is called a ball and the defensive team wants an appeal, it should be granted. Sometimes the ball just finds you. You might try to move out of the way but with the spin, curve or whatever the ball seems to have a homing beacon right for your body. This happened to Mike Winters last night. My high school baseball coach would always say the same thing to players as they were leading off third – “off in foul and back in fair”. He was the coach, so I just did it. I figured it was a safety thing. Only later did I learn this had something to do with the rules. Here is a fun play from Friday night. The runner from second is dead meat. As he gets into a rundown, he remembers the Type A obstruction rule (7.06 (a)). This season Wrigley Field is known for having too few bathrooms and construction equipment where bleachers should be. Most seasons Wrigley is known for its trademark ivy on the outfield wall. This ivy will at times will interject itself into the game. Umpires like to make fun of announcers. We just cannot understand how someone can be around baseball 200 days a year and not learn the rules. I am all about being fair though. In this clip the announcer absolutely nails the ruling. Maybe the worm is turning. The play involves spectator interference. All You Limbo Boys and Girls. Today is a one time holiday for Cub fans everywhere. I wish you all a Happy Kris Bryant Day. He being the goat slaying uber-prospect that will finally deliver a championship. Again, people will wonder what does this have to do with the rules. Baseball-Reference. Holy cow is this a lot of fun to play with. I wanted to get under the hood and think of how this tool can help me on this blog. I got to thinking about balks. Yesterday was Jackie Robinson day across Major League Baseball. Let’s be clear on one thing – this is a yearly event that baseball just knocks out of the park (pun totally intended). The Phillies and Mets game last night featured all sorts of fun stuff. Here is a play from that game. The umpire calls catcher’s interference. On a ball that is not put in play the penalty is pretty easy – the batter gets first base and other runners advance only if forced. Well, it certainly is odd. Of course, odd does not equal illegal. I mentioned yesterday that I was a Cubs fan. While extremely happy to see their 3rd win in a row last evening, I am not terribly excited that their $150 MM off season investment has the yips when attempting pick offs to first base. Kick your feet up and stay. I noticed we have gotten a fair amount of traffic today. I suppose people enjoy reading the terror of Cubs’ blown saves past. Just a quick recap on the intention of this blog. 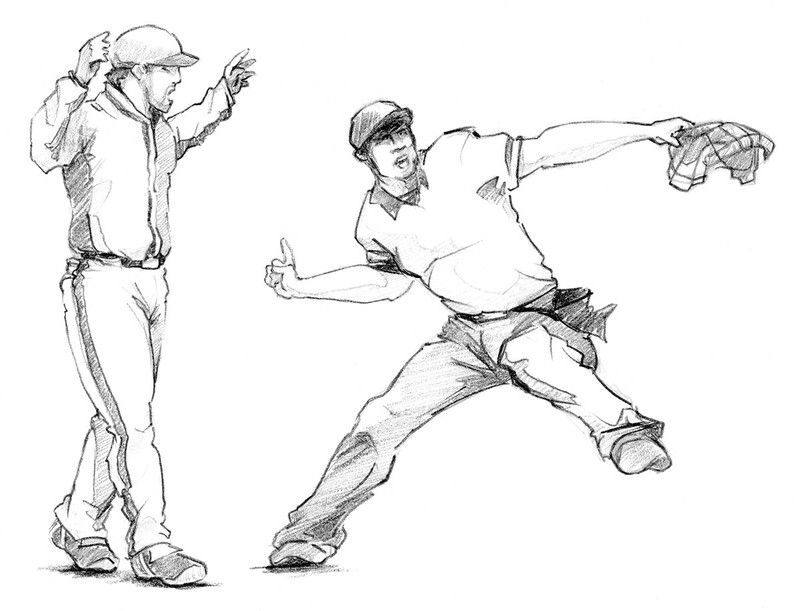 The blog itself publishes short articles explaining baseball rules. We augment the posts with video to help the explanations. We are a go to destination for help in learning rules. He Fakes a Throw to Nowhere. I took an old Talking Heads song and turned it into a headline…clever. I have mentioned before that the trouble with balks are twofold: 1) they happen quickly and 2) sometimes you just cannot believe what you are seeing. Either of these things can cause a delayed call. It's bad, but I've seen worse. For better or worse (most of the time worse) I root for the Cubs. The designer of the book is a Reds fan while the illustrator likes the Braves. Yesterday the Cubs won a game in miraculous fashion. They got a 2 out, 2 strike, 2 run homer in the 9th for a 6-5 win. The losing pitcher was former Cub LaTroy Hawkins. Turn this way...turn this way. Aerosmith had a hit single with the track “Walk this way”. Youth coaches usually make a point to scream “Turn this way” when their players run past first base. They are telling them to turn right. The question I got yesterday from a Facebook friend discusses whether it matters. This is a great example of the umpires using correct timing. Amateur umpires have a tendency to call a ball foul as soon as it heads that way. On overthrows that go out of play, the maxim “two bases from the field, and one from the mound” is used to describes how many bases the runners receive as an award. Usually the trickiest part is whether you give the runner their bases from where they were at the time of pitch or at the time the throw was released. It seems like I have done a lot of posts on hit by pitch. I suppose it is because there are a lot of misconceptions around this rule. Here is a clip from yesterday’s Tiger/Rays game. A lot of umpires are dead set against replay. They rave about changing the game, the human element and other arguments. They might kick me out of the union (expression, I don’t think amateur umpires have a union), but I seriously don’t mind replay. It took one day of baseball for an umpire “controversy” to spring up. Here is the end of the Tigers/Twins game (sorry, the video cannot be embedded yet). Torii Hunter was upset that Joe West did not ask for help on the call. Finally, the long winter is over and there are loads of baseball games to watch. With all the baseball, there will be a slew of situations to review. Here is an interesting one from Texas/Oakland last evening. There are plenty of myths about the rule book. I have already discussed some on this blog. The sneakiest myth of all involves how a game starts. Ask anyone and they will tell you the game starts when the umpire yells “play ball”. Some folks even add this phrase to the end of the National Anthem. Here is a play that shows how much the players and announcers don’t understand the rules. Of course, I cannot hit a curve ball and trip over my words so I will give them a break. The infield fly rule was in effect with the bases loaded and 1 out. The batter skies one about 20 feet in front of home plate. When reading the rule book, oftentimes you roll your eyes because a play seems so preposterous. From the high school rules here is case plat 3.3.1 EE. I received this question via the contact form on our website. If you have a question feel free to send one to me. Here is a great example of why umpires have to know their differences. When this play happens, it will have the element of surprise – a killer for umpires. The rest of the play can get jumbled in your brain. Last week I talked about the hidden ball trick. In the spirit of April Fool’s Day, MLB.com is looking at 10 times the hidden ball trick worked. Hat Tip to Wendelstedt Umpire School for Tweeting this out. April Fool’s Day. The day where people try to one up each other with pranks. I have already seen a few websites pull off some fun stuff. I decided I would focus this April 1 post on a call that is so ridiculous that players were left wondering if it was a joke. There is some NSFW or NSFC (Children) language in this clip. The old adage is that umpires don’t eject managers, managers eject themselves. The statement is meant to convey that a manager is the one doing the acting out so the umpire is just ruling on it. Here is an example of an interesting play with some bad luck mixed in for good measure. The umpire did a fantastic job of seeing the ball hit the runner and calling him out. I could hardly see the ball hit the foot in slow motion. He got it in real time. Those guys are really, really good. Hands are Part of What? Without a doubt the most prevalent rule myth I hear is “hands are a part of the bat”. The argument is that if a batter is hit by a pitch on his hands, he does not get first base because the ball did not hit him, it hit his bat. Why did it hit his bat? Because the hands are part of the bat. I have no idea why this myth exists. It is 100% false. Umpiring is a niche business. Most of the most prominent sites devoted to umpiring (ABUA, Umpire-Empire, Steve the Ump), I have seen and visit quite frequently. In fact, if any of these three were ever blocked by my work’s firewall, I would have a seizure. I was browsing Amazon today looking at other baseball books besides RuleGraphics. Spring is an awesome time for new baseball books. I came across an entire book on the Hidden Ball Trick. I am certainly intrigued by this and will probably pick up a copy at some point. The Rules v the "Rules"
I already posted about the runner’s lane once this week. As a reminder, here is the high school rule (8.4.1 (g)). Since I returned to umpiring 2 years ago (this is the beginning of my third), I have worked about 120 games. I have called this only once. I worked a scrimmage this week and as chance would have it called a player out due to this. If I had this play, I think I would have to vomit before making the call. This is a high school play. "The fielder without possession of the ball denies access to the base the runner is attempting to achieve." Said another way “once a pitcher makes a move towards the plate he cannot throw to a base”. Runner’s lane interference is a controversial call. The problem with this call is that usually it happens as the ball is bouncing away from the fielder. One team is all excited thinking they will get more bases on an overthrow only to have a umpire killing the play. The ball bounced off the center fielder’s head directly to the left fielder. He caught the ball and got a double play. Fun question – was this a legal catch. It sure was. This morning Buster Olney linked to an article about umpire preparation in spring training. There is lots of good stuff in here. The topic is near and dear to my heart as I have a scrimmage this afternoon (weather pending). I try to see as many pitches as I can before the season. My first real game is a week and a half away. Hit by pitch should be the easiest rule to understand. Pitch hits batter; batter gets first base. Yet, there are a few instances where there is confusion. At this point, folks are probably wondering why I linked to a video where a guy hits a double. It is not any ordinary double as the ball bounced before he hit the ball. It is a hit that Roger Federer would be proud of. Without a doubt the rule that confuses most fans is balks. I will admit balks are among the toughest things for me to call as well. Why are they hard to call? This blog is written as a companion to the book RuleGraphics: Professional Baseball. Make sure to check out our website for samples. The book debuted on Amazon as the #1 new release in Baseball > Coaching. It is receiving praise from the umpiring community. Yes, even youth ball mistakes can happen in the big leagues. The video above shows the Giants batting out of order in a game. Batting out of order is another rule that people make more complex than it really is. This winter I attended the Bruce Doane Sr. Umpire Camp (a great camp by the way). Will Carroll is a writer formerly of Baseball Prospectus. He specializes in covering injuries. He tweets under the aptly named handle @injuryexpert. He wrote a book discussing pitcher injuries that can be found here. As his Twitter handle implies, any sports related health questions should go his way. This is a really interesting play. From a strategy perspective the coach pulls this off with an 0-2 count and 2 outs. The thought being a hit at that point to score a run is unlikely. It makes gambling a strong option as the worst result is the hitter gets to lead off the next inning with a fresh start. Or as Tim McCarver and 85% of baseball announcers say “interference”. Obstruction is one of the most misunderstood rules in the game. in reality it is not all that difficult. The problem is that on most of these plays, the runner looks out only to be called safe creating confusion. Often when reading the rules, I gloss over certain ones thinking “no way this will happen in a game”. Prime example are the rules covering detached player equipment. Rule 7.05 (a-e)outlines the penalties for touching a ball with detached equipment. Here is a play that is making the rounds on social media. It is another example of the importance of knowing the rules of the level you are working. This weekend was the SABR analytics conference. I did not attend, but I follow enough smart SABR guys on Twitter to keep up to speed. If you like baseball research, join SABR. I have been a proud member since the early 2000s. Realize that without anything on the line this would be a crazy play. Add to it that this was the bottom of extra innings and if the run scored, it would have ended the game and this becomes about the craziest play ever. Things get heated on the diamond. We all get that, but bumping an umpire is a no-no. Before talking about the ejection, let’s talk about the play. This was a college game, but the rule in the pros and high school is very similar. Pretty fun play there. The question for umpires is “was this legal”. The annoying answer is that it depends on the level you are working. Yes, not all rules are the same. In fact, there is an entire book dedicated only to the differences between high school, college and professional baseball. It is a thick book. The video is from 2008. It was an example of a switch pitcher versus a switch hitter in a minor league game. Switch hitters are rare but not exceedingly so. There are always a collection of them in the majors and have been plenty in the history of the game. Switch pitchers on the other hand – very rare. For articles, please check out our blog.